Did you know that many flowers can be made into healing ointments? We love to keep flowers like lavender and calendula around because they offer relief for a variety of conditions, such as dry skin, burns, and rashes. In addition to offering a bit of natural medicine for some of our ailments, these flowers (and several others) are quite beautiful to look at, so we make sure we frequently have some in our garden in or a vase indoors. The following are a few flowers that you can use to make healing ointments with. Simply take the flower’s petals, whole or crushed, and add them to a neutral plant oil base like almond or coconut oil. Lavender is one of the top flowers for healing. It offers a calming aroma that can help out with bouts of stress, headaches, or insomnia. And, it possesses properties that promote healing when used topically. 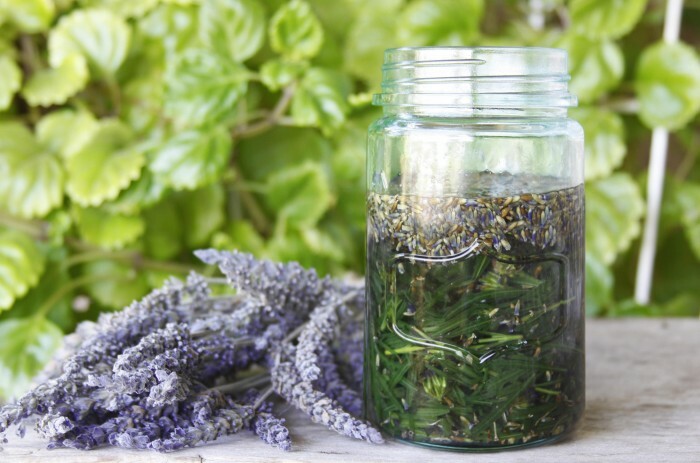 You can bring lavender’s spirit-soothing benefits into your life by using fresh, or dried, aromatic lavender flowers in potpourris, temple balms, and bath soaks. To heal skin conditions like eczema, or skin that’s painful to the touch, turn to crushed lavender petals infused into a carrier oil like olive oil. Lavender is an anti-bacterial flower too, so apply it with a plant oil to treat acne. Some of the many healing powers of calendula include treating rashes and eczema, speeding up the healing time of cuts and burns, and reducing inflamed skin. Also known as the pot marigold, calendula is a plant that you can easily grow yourself if you want an on-the-spot remedy to calm the stomach, nerves, and skin. Put calendula petals in apricot kernel, oil or another plant oil, and apply your formula on the skin to prevent wound infection and soothe irritation. Comfrey is regarded as “one of nature’s greatest medicinal herbs.” It’s no wonder why. This super healing herb makes a great ointment, when mixed with a thick oil like coconut oil, to heal a variety of health problems, including broken bones! Comfrey ointment applied topically can shorten the time it takes for bones, muscles, and skin to heal. This flower, when used with a carrier oil, also helps treat diaper rash. These are just a few of the flowers we like to turn to for natural healing. Do you have any flowers you make healing ointments with? If so, let us know in the comments below. We’d love to hear about them!